Each year we host the Global Health Photo Contest to recognize the many creative, thought provoking and ethical photos that our students, faculty and colleagues take. We presented our winners during the Global Health Town Hall at the end of March. These beautiful images and inspiring stories remind us that global health is all around us. In a farmer’s field, in children playing, or through the sharing of a quiet moment. We wanted to take the opportunity to show you the global health stories of this year’s contest winners. All the submissions, however, were truly thought provoking, attesting to the creativity and depth of global health involvement of the Dalhousie community! This year, our 2nd place winner was Ho Chi Minh Commute by Carolyn Reardon and our 1st place winner was Honduras by Laura Stymiest. This photo was snapped from a taxi during the morning rush hour in Ho Chi Minh City, Vietnam, where most commute by motorbike. I thought it was an interesting glimpse into the daily happenings of commuters in this busy city, where the hectic traffic challenges our perception of public safety as Canadians. The riders in the photo appear quite orderly for the split second the image was captured, while the different directions in which the riders aim their bikes and glances reveals the dynamic nature of each of their positions. 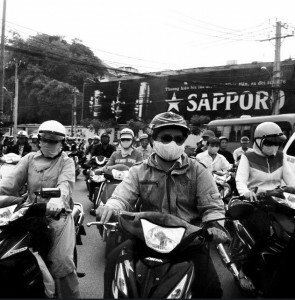 The face masks worn by each of the riders in the photo speaks to local concern with air quality, while also providing a representation of how as individuals, we take measures to protect our own health on a daily basis, and challenges the viewer to compare and contrast such measures in their own daily life with those in the image. Prior to entering medical school, I was part of a group of health professionals who traveled to rural Honduran villages annually to operate mobile health units. Many mornings we would arrive in a village just after dawn to a line of hundreds of individuals hoping to receive care. My role was to translate from Spanish to English for a Pediatrician. I remember one day in particular where one after another we saw emotionally charged cases. An infant failing to grow secondary to a cleft palate that had never been repaired, preventing him from feeding normally. A young boy who had lost his vision after an accident while working in a plantain field. At the end of the day we had worked through our lineup but I felt we had hardly scraped the surface of this community’s health needs. 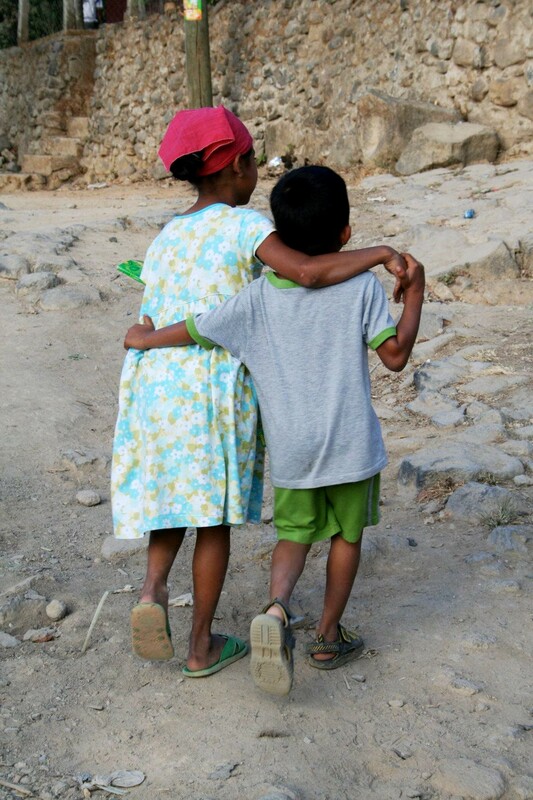 A bit discouraged, I was walking back to the bus to begin loading up our equipment when I saw these two young children walking home in an embrace. I had a moment of realizing that children represent the best of humanity. Although they lacked many of the luxuries of children at home, these children looked to be genuinely happy. I imagined them to be resilient and their warmth spelled out health to me — a kind of health that surpasses our usual definition and places happiness at the core. Thank you to all who submitted photos this years, the images and narratives were truly inspiring!